Shown are uniform patches worn by fallen firefighter Joe Patterson. For as long as Jennifer Patterson can remember, her 10-year-old son, Adam Liste, has wanted to be a firefighter. So after her husband, Paint Creek Joint/EMS Fire District firefighter Joe Patterson, tragically lost his life in an accident on duty last month, she wanted to do something for Adam’s upcoming birthday to lift his spirits. 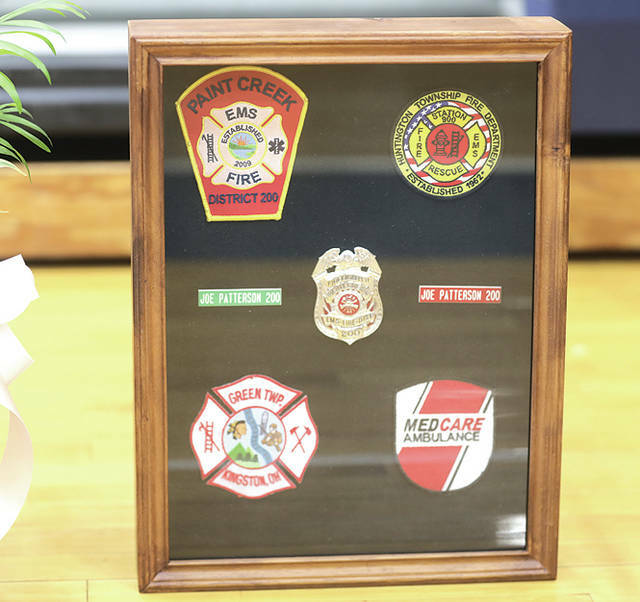 Jennifer posted on Facebook recently asking area fire departments to send her uniform arm patches, like the ones Paint Creek presented to her and Joe’s parents at her husband’s funeral, so she could give them to Adam on his birthday July 19. She thought she might receive a few for Adam to place on his bedroom wall, but as other EMS and firefighter groups started sharing her post, the idea went viral, and now the response has touched her, too. “I was just hoping to get a few, then it took off and got a lot bigger,” Jennifer said. Earlier this week, she said she received a dozen patches in one package, received another package with a patch and T-shirt in it, and has received messages and calls from people in Canada, California, Colorado, Florida and other locations across the country, all wanting to send more. She said she’s trying to keep the patches a secret until a birthday party she’s planned for Adam on July 22. Adam will be a sixth grader in the Waverly School District this year, and he still wants to be a firefighter one day. “That’s what he’s always talked about doing since he’s been old enough to talk,” Jennifer said. She said the patches will be placed on a board that will hang in Adam’s room. “I think he’ll be pretty surprised that he has that many to hang up,” Jennifer said. Joe Patterson, 33, died from injuries sustained in an accident at the Paint Creek station in Rainsboro on June 24, according to Public Information Officer Branden Jackman. Jackman said Patterson was working with compressed air tanks tanks when one experienced “catastrophic failure.” Other firefighters were in the vicinity — “they were right there,” he said — but none were injured. She said anyone else who would like to send Adam a patch can drop them off at the Paint Creek stations in Greenfield, Hillsboro or Rainsboro, and Paint Creek staff will make sure she gets them. This entry was tagged fire patches, highland county, Hillsboro, joe patterson, paint creek joint ems/fire district, rainsboro. Bookmark the permalink.